The primary objective of our trip to the Maldives was to completely relax and so a visit to the hotel spa seemed like a necessity. As I mentioned in my Velassaru Maldives post, there isn’t really that much to do in the Maldives other than sit on the beach and relax. But getting out of the sun for an afternoon and treating our skin to some much-needed hydration after all the sun exposure seemed like a good idea! The spa at Velassaru is absolutely beautiful. It is one of the nicest hotel spas I’ve ever been to, actually. 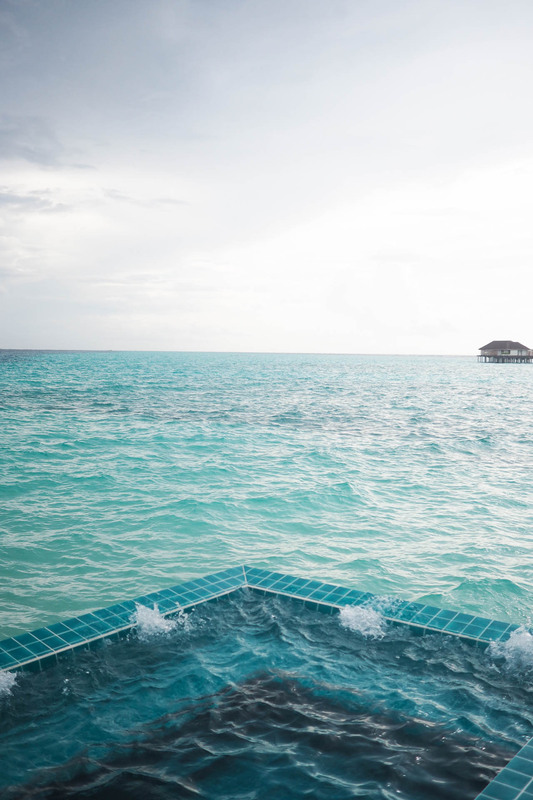 It is located beside the water villas, meaning that you are literally having your treatments out at sea. The main building of the spa has an outdoor area with loungers, steam rooms and an incredible infinity pool looking over the ocean. We arrived at around 3pm to use these facilities before our treatments and it was a little bit cloudy! But it was still beautiful all the same. I’m wearing this swimsuit from Ted Baker (which is now on sale!) and I absolutely love it. It’s a bit more risqué than what I normally go for, but it’s actually quite flattering I think! I absolutely love wearing white with a tan. Although I will say this isn’t the most practical if you’re wanting to swim a lot – it isn’t the most supportive swimsuit, I’ll just say that. We went for a spa package when we booked into the spa – I believe it was called ‘Velassaru Ritual’ or something along those lines. 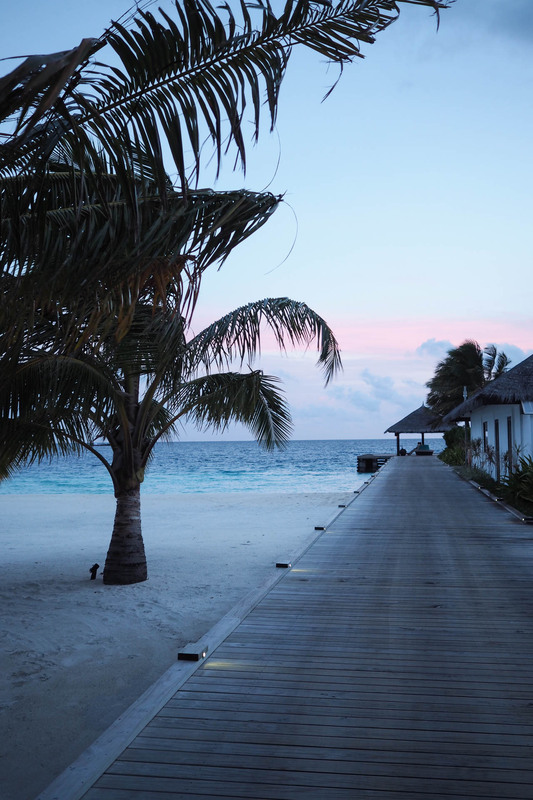 This involved a scrub, wrap, scalp treatment, massage and facial all using ingredients found in the Maldives. I’d highly recommend this package, as you got more treatments for the same price as the other packages and it was also just so dreamy. After our treatments, the sun was starting to set. So we left the spa and headed to the beach to watch the sun go down and the sky change colour. 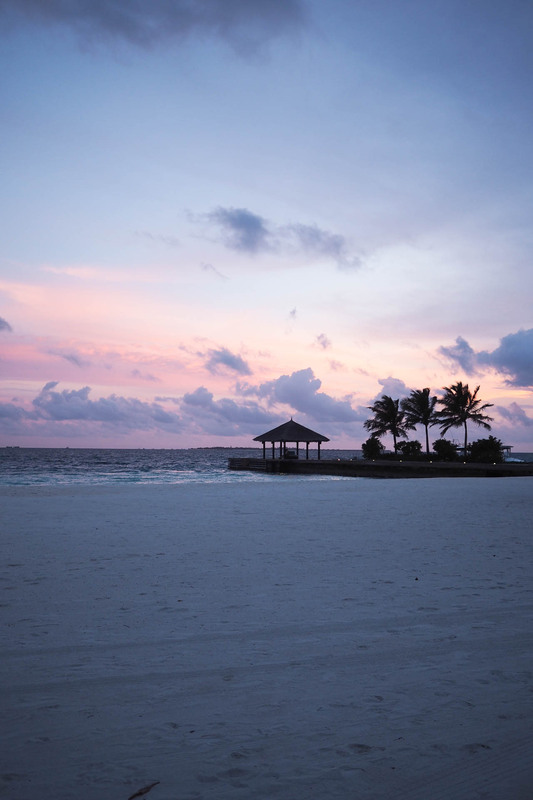 Sunsets in the Maldives really are quite special – the contrast of the bright blue of the sea and the pink in the sky is striking. Every single stage of the sunset was so photogenic that I was running along the beach like a madwoman trying to get all the colours, backdrops and angles that I possibly could. It possibly irked all the honeymooning couples trying to get romantic photos on the beach, but you’ve gotta do what you’ve gotta do for that shot! Feeling rather relaxed (and pretty oily too…) we wandered back over to our little villa when the sky started to get dark. The sunsets here seem quite long, possibly because the colours change so much, but darkness comes so quickly in the Maldives. Then you are left to turn on your iPhone torch to make your way back to your room! 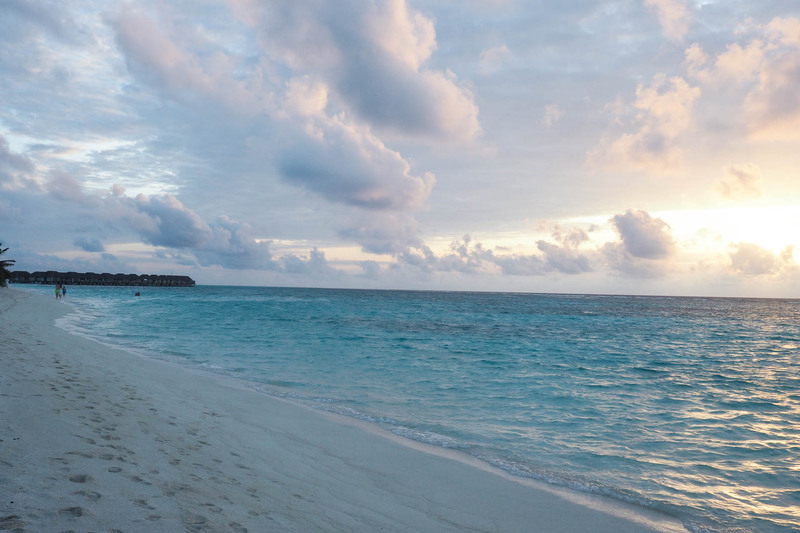 So that was a little photo-diary of the spa and sunset at Velassaru Maldives. My next post is going to be about how to book a trip to the Maldives for less, which can honestly be done! Let me know if you have any questions about booking a trip to the Maldives and I’ll try to answer them in the next post as well. 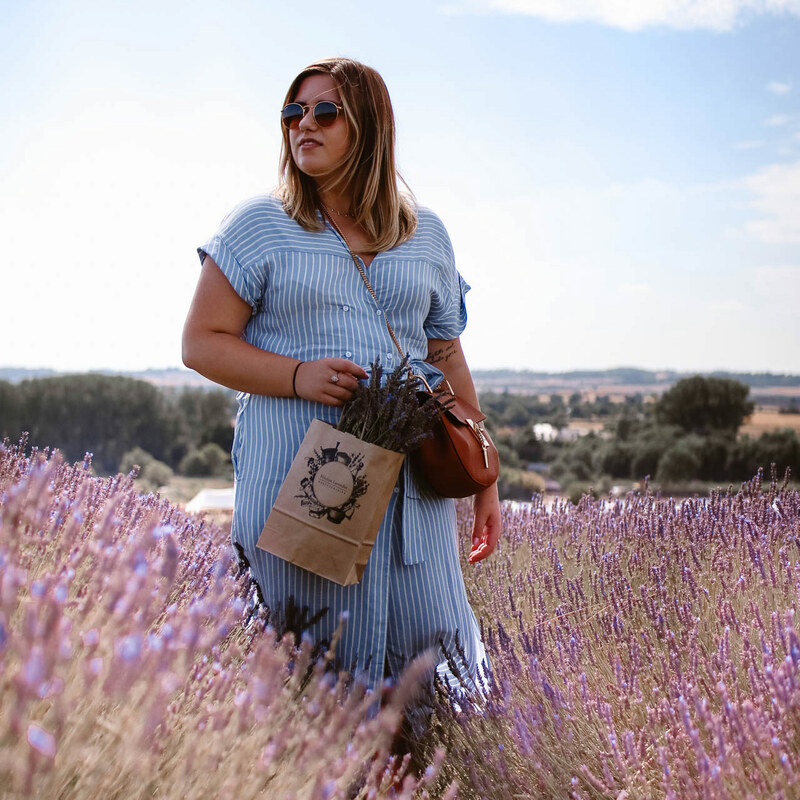 In the meantime, have a little read of my review of our hotel here and then you’ll be all caught up! "How to Book a Trip to the Maldives for Less"
"What I Wore to my Graduation Ball"